Mental Health | Who needs normal?! I grew up believing that there is nothing I can do well. The only thing I believed I was useful for was to give other people sexual pleasure. That’s sick, obviously, because I was a child. Awareness of who we are grows through the kind of feedback we receive about ourselves. As a social species we use others as a mirror to see ourselves. By how they react to us, verbally and through behavior, we draw conclusions about ourselves. My mother was unable to be a good mother. My needs usually went unmet. She was unpredictable, angry and often aggressive towards me. I concluded I was unimportant, unlovable, unable to do something right and that I deserve punishment just for being there. My step-father’s interest in me centered solely around the sexual abuse. If I didn’t do what he wanted me to, he became violent. My mother often said that she only kept me around because I had made him “addicted” to me. I concluded that I had to earn my right to exist by making myself available for abuse. At school I got held back because I did not learn. Teachers used to say that they are not sure that there’s anyone actually at home inside of my head. “The lights are on, but nobody’s home.” I concluded that I must be really dumb. In the institutionalized years that followed people became annoyed with me very often after what had always looked like promising starts. I concluded that I may look worth saving on the outside, but that there was nothing inside of me that would keep anyone going. As you may imagine, my self image was real bad. I didn’t like myself. Like, at all. 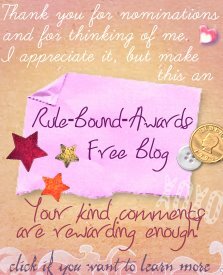 The feedback I had received painted a very unlikable picture of me and I was convinced that it was true. Because as a social species we tend to take social feedback seriously. Unfortunately we’re also not born with a way to tell whether the person who reflects an image of us back through feedback is a good mirror, or one right out of a fun house. Imagine you had looked into a distorting mirror all your life. How would you like the way you looked? And if you had grown used to always looking a certain, distorted way in the mirror because you never saw yourself in any other mirror, would you believe the reflection if it suddenly were different? I went through a lot of unhappiness and trouble with the positive feedback I received after I met my family and came to live with them. Lots of fear that once they discover how terrible I really am, they will want to have nothing to do with me anymore. In lots of ways I have tried to force them to hate me and be repulsed by me. Sometimes I could not stand their presence. At the same time I am and always was mortally afraid of losing them. But I wanted to have it happen, because I was convinced that it was what I deserved and what was going to happen anyway. When things don’t match up, when everything is a mess, when you don’t know who or what you really are or are not, that’s what happens. Lots of tears, tantrums, hugs, yelling, cuddling, passionate hating, ardent loving and most of all lots of patience later, I am pretty sure that my “self” I have been aware of, was really not very realistic but just the reflection of other people’s mental issues. I don’t feel horribly unlovable, useless and dumb anymore most of the time. I am starting to allow the thought that there are things I might be good at, that I can be a kind person who others like and some even love. That this is not just some con act, but actually part of who I am. At the same time I do not have a lot of practice thinking those things and old habits die hard and I have moments where I get very confused and find it hard to assess who I am. What I am. What I can. That I am important to someone. It helps that my family are aware. Sometimes my mom sings the Lumineers’ “Ho Hey” chorus to me. You know, the “I belong to you, you belong to me, you’re my sweet-heart” part. She does it just because. Just because she wants to. I really like that because it feels like she means what she sings and wants me to know. 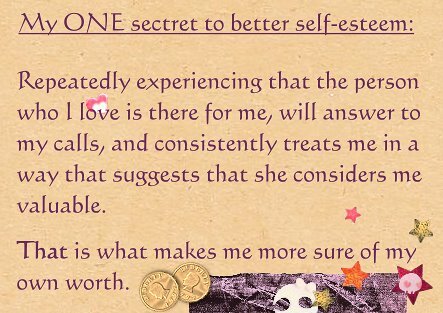 I think finding the right mirrors for myself and the right standards to assess my behavior and my “self” with is one of the keys for a better and more realistic awareness of myself and for becoming more confident and stuff. Also, it helps to actually DO things that I can then assess. After all, staying on the borderline isn’t much fun. Lines are narrow. Borders are boundaries. And while boundaries are not necessarily bad, I don’t want to live ON them, but within them. And maybe sometimes beyond. In a good way. And a feeling good about myself way. So that’s where I want to get. Slowly but surely. Just found this on youtube. Loved it and wanted to share. After the point of near-despair because I didn’t seem to understand a thing, I have now gotten to a point where I think I got the gist of it. 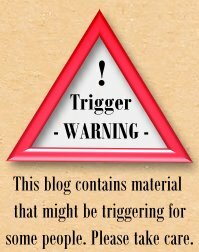 This is a post about how experiences shape the way our genes work, to underline that while our genetic makeup might be hardwired, which parts of it get activated is often due to what kind of experiences we make. The premise of that is that as humans, at the moment we get conveived our genetic makeup is determinated by the individual mix of chromosomes from our mother’s and father’s DNA. This individual mix contains lots of possibilities there, laid out by what our genetic makeup contains, but by that point they are still possibilities. Plenty of them. With some genes there is little choice, such as what our hair or eye color will be. Others traits of ours, however, are the result of a mix of genes that are less predetermined. Which get realized and which don’t largely depends on what kind of experiences we make. Both inside the mother’s womb as we grow, as outside of it, during our childhood (as well as our adult life). So much for the theory. Here is how it works on a biological basis (the way I came to understand it). The most important thing to know is that the brain, which is part of the nervous system, communicates internally with electric signals (inside of nerve cells) as well as chemical signals (to get information from one nerve cell to the next). So the brain’s language consists of those two parts. So far so good. What happens now when we experience things? The kind of experience that we have (like sensual experience, be it through touch, seeing things, hearing things, feeling things, anything) gets translated into electrical impulses. Those come in through lots of little “arms” that nerve cells have. Those incoming impulses stimulate the nerve cell. 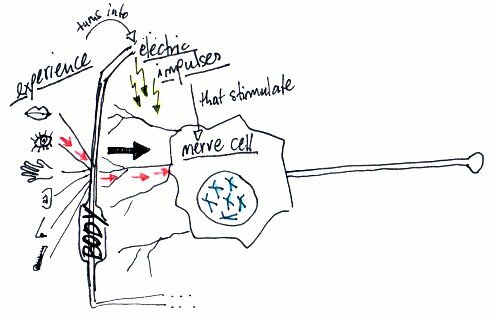 What happens when the nerve cell gets stimulated in a certain way? The stimulation releases messenger proteins. 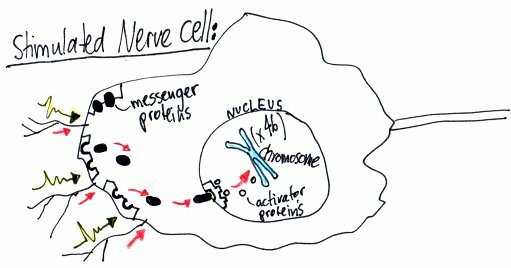 Messenger proteins are proteins that carry information to the nucleus of the cell. The nucleus is where our genetic makeup is. Every nerve cell (as well as most other cells in the body) is equipped with all of our genetic information, which consists of 46 chromosomes. The important part here is that, once stimulated, the activated messenger proteins in turn stimulate activator proteins inside the nucleus, where all of our genetic information is. 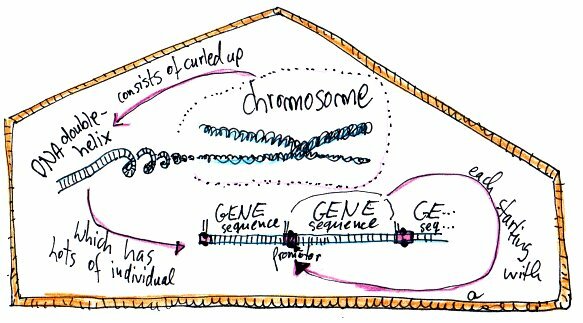 Now let’s look at the chromosomes, because that’s important to be able to understand what happens next. Anyway, on this double helix – if we unspiraled it to look – we’d be able to see one gene sequence after the other. Really, really, really many of them on each single chromosome. And each of those gene sequences starts with a promotor. Keep that in mind, because it’s important. Okay, so you kept in mind that each of the many genes on the looooooooong DNA helix starts with a promotor. That’s important because depending on what kind of activator protein has been released by the incoming information, this protein matches with a specific promotor. Once the activator protein has successfully matched with a promotor, the promotor triggers a slicing protein that temporarily slices (unzips) the double helix that makes up this gene sequence. 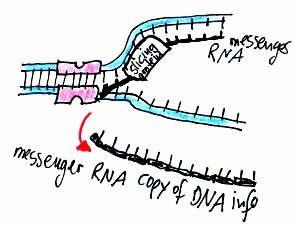 That is important because messenger RNA pieces can match with the now-open strand of DNA. By matching up to the DNA they make a copy of the information that this gene carries. Once they are done matching, they have joined to a little string of messenger RNA and let go of the DNA to float off. The job is done and the double-helix zips close again. So now there is a messenger RNA copy of what the gene says. This copy is able to pass from the nucleus into the cell body where it seeks out the so-called ribosome. The ribosome is like a building site for proteins, which reads the info of the messenger RNA. Depending on the information that the messenger RNA carries, the ribosome joins together the building parts that for example neurotransmitter proteins consist of. Which proteins get built therefore depends on which gene was activated and what information was on that gene. Everyone familiar with mental health issues will surely know how valuable neurotransmitters are. A lack of neurotransmitters like serotonine, for example, can cause stuff like depression. Which is why psych drugs come and add artificial neurotransmitters (or agents that inhibit the ability of the neurotransmitters to get resorbed into the nerve cells after they have been released to communicate information to the next nerve cell). BUT, and that’s the real big thing all this is about – while our genes determine which neurotransmitters are built, for example, it is our experiences that determine which genes get activated. So the way I understand it, it is kind of impossible to keep nature and nurture apart, because one influences the other. Especially during pregnancy, infancy and childhood, there are apparently many windows of opportunity during which the kind of experiences that a person makes determine WHICH of the many possible genes that are there will be the ones that get activated. Now this may sound like a small thing, but it’s actually a big one. Everything we are is ultimately a result of which genes get or got activated when. But this is not entirely predetermined. Experiences have a large influence on which of the many possible genes get activated. Also, there is a thing called neuroplasticity, which basically means that throughout life the brain is able to change and develop. Only because one thing is activated (or inactive) right now, it doesn’t mean it has to be forever. If there are enough experiences, our brain can change with those experiences and genes that were activated can get deactivated and vice versa. It probably takes longer for experiences to achieve that later in life than it took during the window of opportunity, but the way I understand it, the basic fact that what part of our genetic makeup is activated is open to influence by what kind of experiences we make remains. So what does that mean? To me it means a lot of things. It means that only because my brain is working in a certain way now, it can change the way it works if enough experiences that are different to the ones that caused it to work that way come in. It means that statements such as “you will have to take that psych drug for the rest of your life” are highly questionable to my mind, because there actually IS the possibility that given we make enough suitable experiences, our brain can learn to activate different genes again that will be able to bring the brain back into its neurochemical balance, for example. And it means that what happens to children during the pregnancy, infancy and childhood is SO, SO, SO VERY IMPORTANT, because that’s when the windows of opportunity regarding which parts of their genetic makeup will become active are open. I really believe that THIS is where successful mental health care should start. Making sure that children don’t experience stuff that turns all the wrong genes on to mess up their lives later! BEAR, M.; PARADISO, M.; CONNORS, B.W. (2006): Neuroscience: Exploring the Brain. Lippincott Williams & Wilkins. PERRY, B.D. (2002): Childhood Experiences and the Expression of Genetic Potential. in: Brain and Mind 3: 79-100. Kluwer Academic Publishers.